Muddy Mice, our outdoor classes for pre-school children and parents or carers are proving really popular. Running since September, our Muddy Mice have already enjoyed what the farm has to offer in Autumn and Winter and now looking forward to seeing what Spring has to offer. 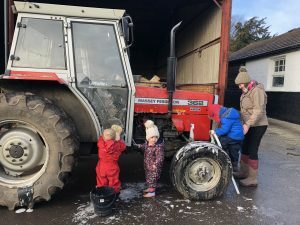 Following the farming and natural wildlife calendar the classes have so far included a whole range of activities including making scarecrows, nature walks, cleaning tractors, tractor rides, feeding cows and lots more. One mum, who has been bringing her two children along since September says it is the highlight of their week. Next term we are looking forward to planting lots of vegetables, celebrating pancake day with eggs collected from our own chickens and exploring the woodland even more as we come into a new season.